Getting to the Bee Laboratory, in the middle of the Patuxent Wildlife Research Refuge in Laurel, feels like entering spy-land. The turnoff from Route 197 is remote and the gate requires a code to open. A small sign at the top of a windblown, grassy hill reads Endangered Wildlife Protection Area. To its left, set back from the road, the tan building is cordoned off by electrified fencing. 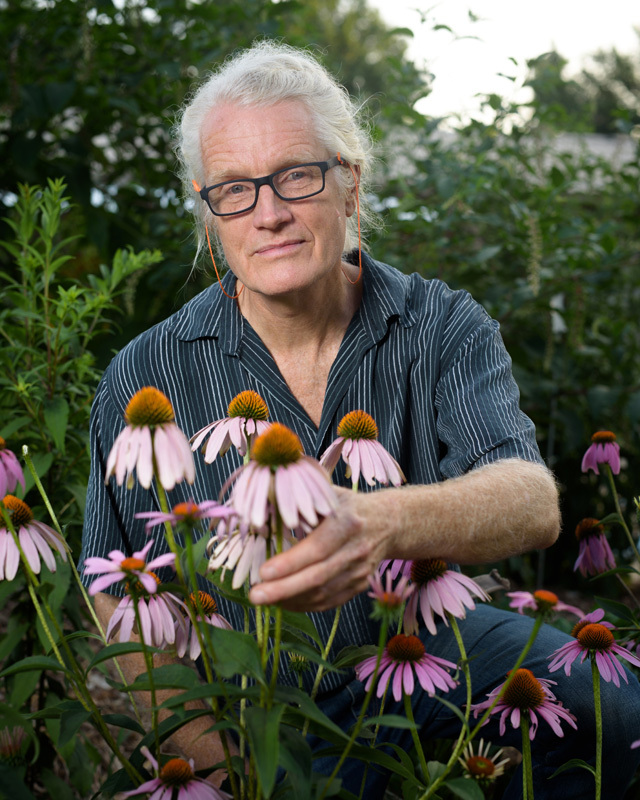 But beyond the wire mesh, alongside the native flower garden, stands Sam Droege in hiking shoes, brown shorts, and a bright, flowered button-down shirt—near-perfect posture, tanned legs, arms, and face, creamy white hair pulled neatly into a short French braid. His body language conveys centeredness and calm. He’s speaking with two interns from Greenbelt’s Eleanor Roosevelt High School, discussing the details of their next experiment. 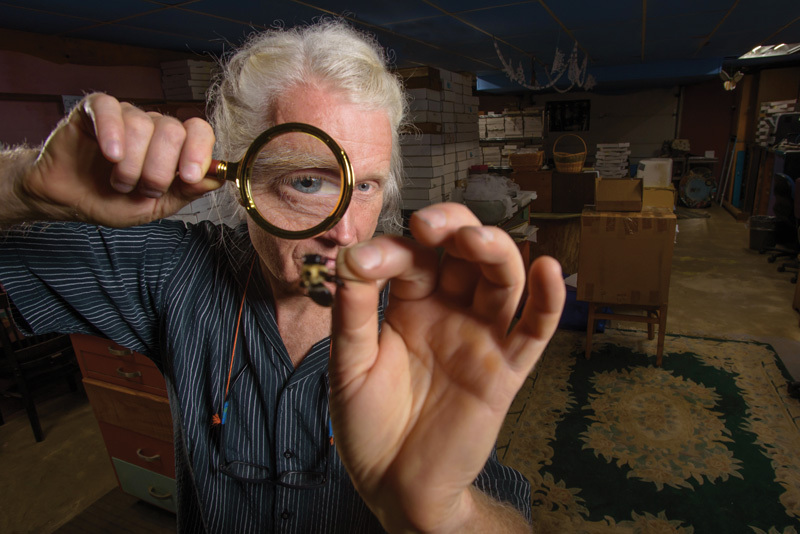 Sam Droege inspecting a bee through a magnifying glass, Patuxent Wildlife Research Refuge, Laurel, MD. 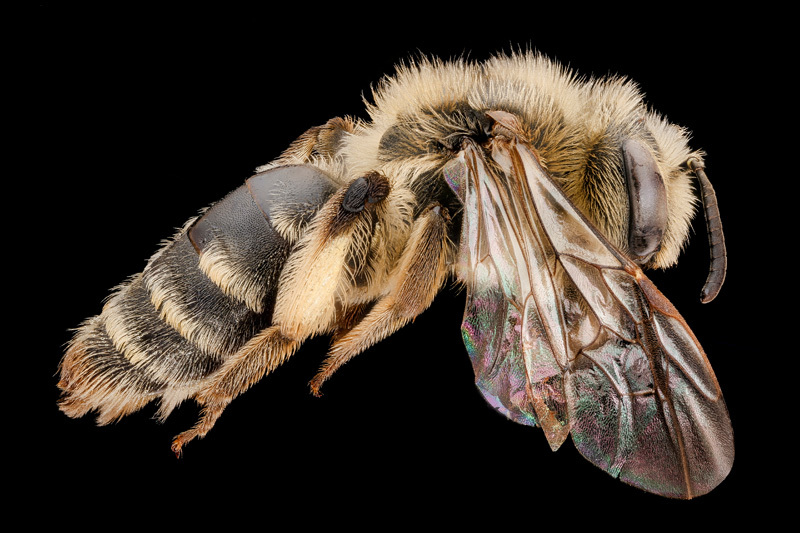 Today, Droege is one of the nation’s leading bee specialists and species identifiers. 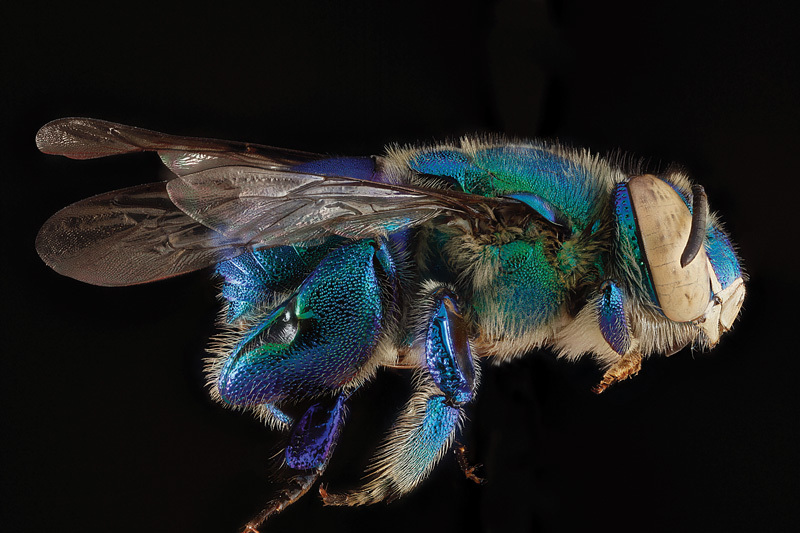 He started the US Geological Survey’s Bee Inventory and Monitoring Laboratory from the ground up and maintains its extensive database, which includes breathtaking, high-resolution photographs of bees. Prolific in his work, he has written and collaborated on a legion of articles, guides, and protocols for monitoring pollinator communities, among them Bees of Maryland: A Field Guide and the sweetly titled The Very Handy Manual: How to Catch and Identify Bees and Manage a Collection (A Collective and Ongoing Effort by Those Who Love to Study Bees in North America). His email tagline reads, “Why Did You Mow My Flowers? 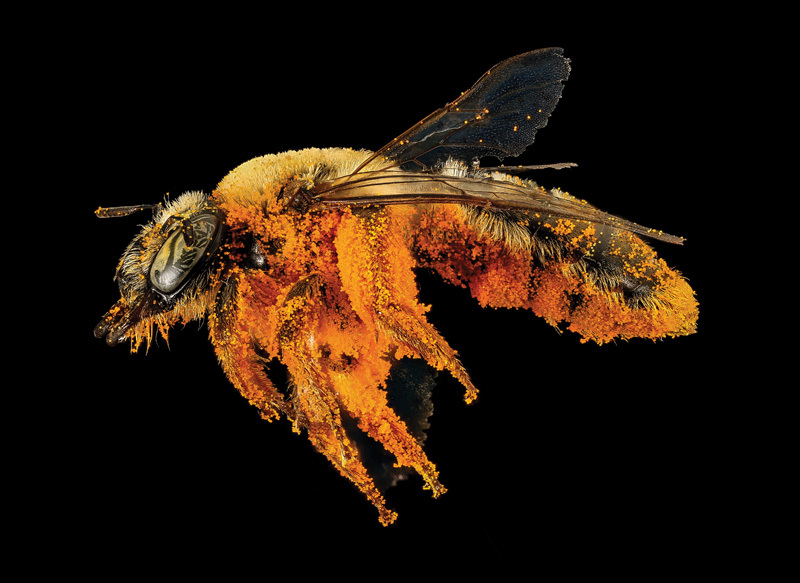 – Bee.” He founded and manages the online bee inventory, monitoring, and identification discussion group. His passion for nature and inquiry pours out of him, touching everything around him. Take the Bee Laboratory, for example. Droege explains how he gutted and repaired the building, crimping the ends of the corrugated aluminum walls by hand to keep out mice. Inside, shelves are stacked with hundreds of pizza boxes containing thousands of specimens, all cleaned, mounted, and numbered. The camera set-up is a mix of high- and low-end technology reminiscent of the movie Brazil. The lavatory is a sight to behold, with beautifully mosaicked walls and flooring constructed and pieced together by Droege; he had to stop work on the room because it did not meet government specifications. 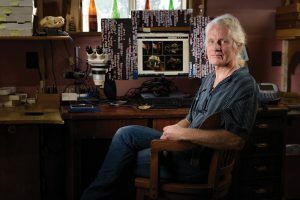 Everything in Droege’s built environment is functional and comfortable, and most of it is remarkable works of nature, science, or art. Sam Droege sitting at his office desk, Patuxent Wildlife Research Refuge, Laurel, MD. The same goes for his house, nestled against state land in Upper Marlboro. The inner walls, ceilings, and stairs are constructed from salvaged wood, much of which he milled himself, maintaining natural contours. Hand-tiled surfaces, artwork, and research equipment abound; a moth study is underway in the backyard. A cozy daybed beside a set of windows invites one to meditate on his vast native species garden. It’s a cross between an upscale Airbnb and a nineteenth-century prairie homesteader’s abode, deeply in harmony with nature. 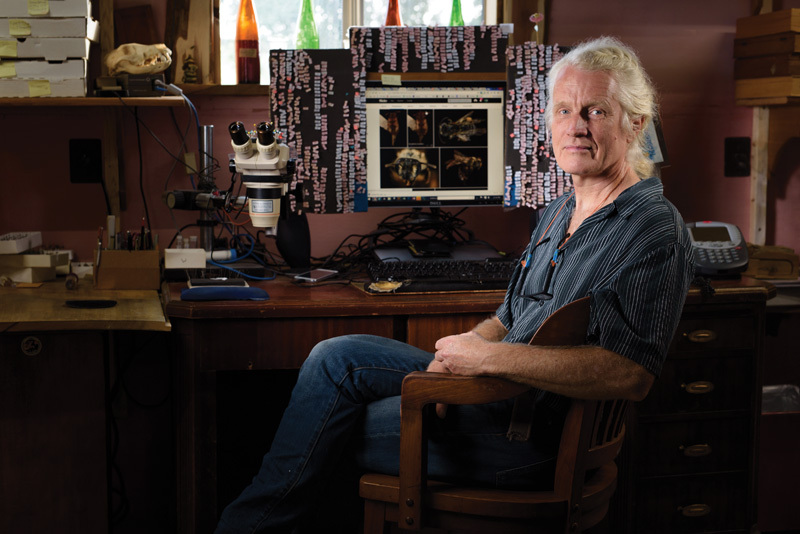 “I was always fascinated with everything,” says Droege, recalling his youth. Across the street from his childhood home in Hyattsville, he and a friend had run of the wooded area along the Anacostia River, making trails, watching animals, and collecting rocks. After developing their own rock taxonomy, a neighbor gave them a book on rocks so they could truly identify them. At age eight, his interest turned to birds, learning about and identifying each specie he saw. 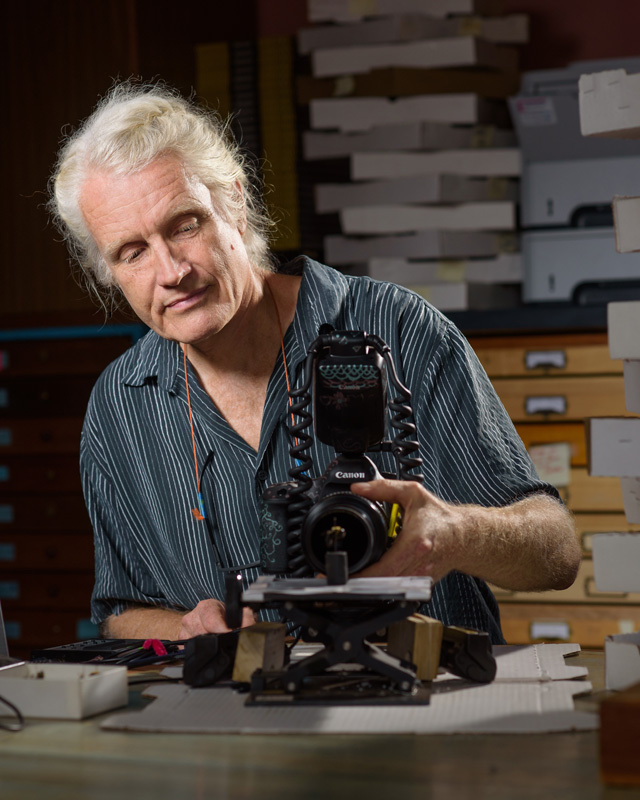 Seeking technical support pre-internet, Droege found Birds of Maryland and the District of Columbia by Robert E. Stuart and Chandler S. Robbins in the local public library and dreamed of acquiring the out-of-print book. He thus began a circuitous search for Robbins to ask for a copy. While he never found the book, he found his people, including Robbins, in Laurel, and was invited to join the local bird club, getting involved in bird banding projects and learning birdsongs by ear. 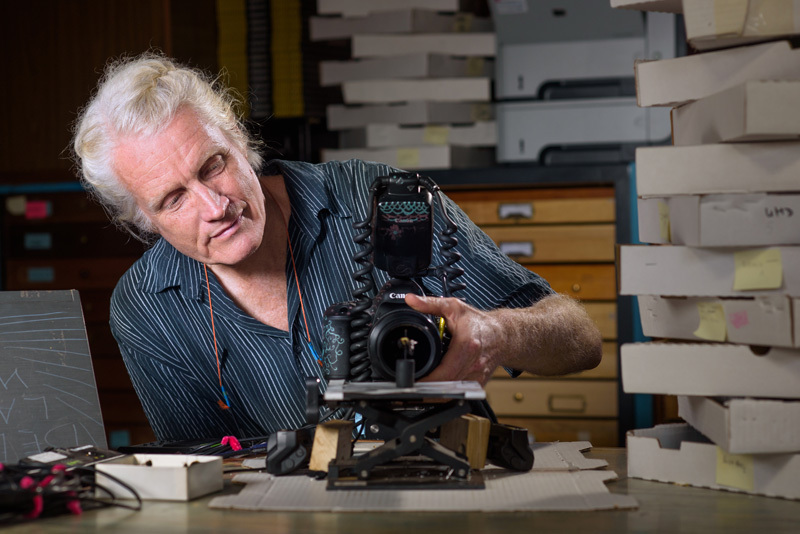 Droege, however, is not a bird lister—“If I can’t remember I saw a clay-colored sparrow, then I need to see another clay-colored sparrow,” he remarks with a twinkle in his eye. After college, graduate school, and a work stint in California, he returned to Maryland to work with Robbins at the Patuxent Wildlife Research Station. Much of Rachel Carson’s groundbreaking book, Silent Spring, sprung from research done at Patuxent. 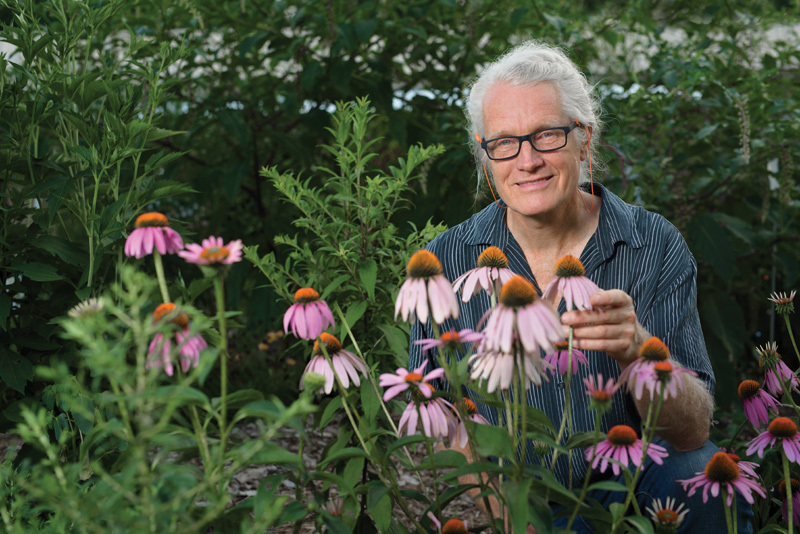 One of Droege’s nascent projects— partially influenced by a recent find of 1,300 dead bumblebees under some linden trees near DC—is working with contaminant scientists to conduct neonicotinoid studies on bees. “When trees are treated [with insecticide], the tree takes it up and its sap becomes poisonous. If it’s a blooming tree, then the pollen and nectar are also poisonous, and you are disseminating that poison,” he says. Sam Droege preparing to photograph a bee specimen, Patuxent Wildlife Research Refuge, Laurel, MD. Sam Droege in the garden outside the Bee Lab, Patuxent Wildlife Research Refuge, Laurel, MD. 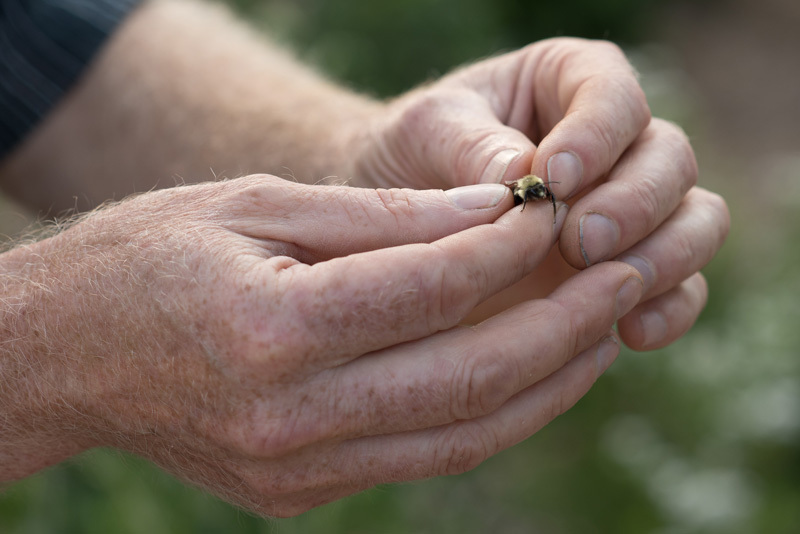 Sam Droege holds a male bumble bee. Male bees do not sting. 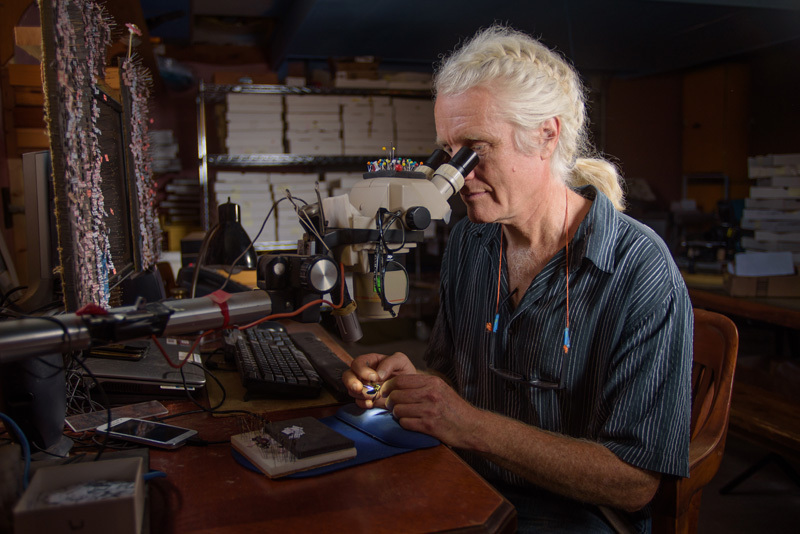 Sam Droege inspecting a bee through a microscope, Patuxent Wildlife Research Refuge, Laurel, MD. Error: Error validating access token: Session has expired on Saturday, 09-Mar-19 15:57:50 PST. The current time is Wednesday, 24-Apr-19 07:20:45 PDT.